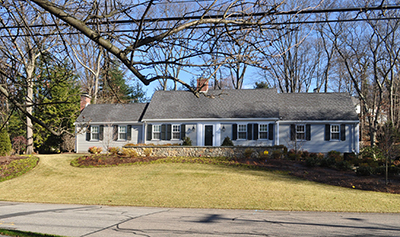 Topography divided the back of this 1930s colonial into two spaces. On one side, there was a large level lawn space with no direct connection to the house. On the other, a complicated system of stone walls and steps served as the main connection from the house to the lower-level driveway. 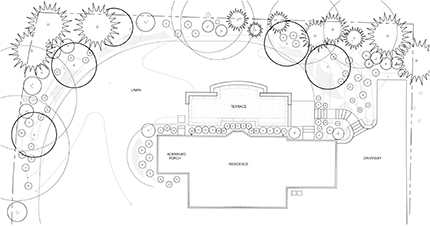 The new landscape design involved extensive topographic changes to create a more direct circulation pattern and a centrally located terrace surrounded by an informal garden. Since the stairs will be used year round, a mostly evergreen palette is enhanced with spring daffodils and virginia bluebells, hostas and astilbes. The goal was to design a terrace that related to the main facade of the house and embedded itself as an element of the garden. In the new design, bluestone paving and fieldstone seat walls are softened with masses of hydrangea and box hedges. Turf steps descend from the center to a broad curvilinear lawn. In the new perimeter garden, views to neighbors are carefully screened with large evergreen trees and shrubs. Flowering trees, underplanted with bold drifts of spring bulbs and summer perennials, create an informal and colorful viewing garden.